G-FORM REACTIVE PROTECTION TECHNOLOGY (RPT™) USES PROPRIETARY, PATENTED TECHNOLOGY AND DESIGNS TO PROVIDE THE BEST COMBINATION OF IMPACT PROTECTION, COMFORT AND FIT OF ANY HIGH-PERFORMANCE PROTECTIVE GEAR, ANYWHERE. SOFT AND FLEXIBLE UNTIL THE MOMENT OF IMPACT, YOU’LL ONLY NOTICE YOU’RE WEARING IT WHEN YOU NEED IT. At rest, the molecules in G-Form RPT products slightly repel each other, making the pads soft and flexible for unparalleled comfort and range of motion. Upon impact, the molecules instantly bind together, hardening the material, dissipating and dispersing the energy, and keeping the wearer protected. After the moment of impact, the molecules once again repel each other, returning the pads to their soft, flexible and comfortable state. Key Coverage/Protection Our body-mapped designs cover vulnerable areas to ensure impact protection where itâ&#x20AC;&#x2122;s needed most. Articulated Design Flexible at key locations, G-Form products ensure total freedom of movement. Low Profile Sleek and streamlined, G-Form products provide a close fit for comfort and easy athletic movement. Maximum Comfort & Compression Fit The close, supportive fit provides maximum comfort and support for muscles and joints. COPYRIGHT 2018 G-FORM, LLC. ALL RIGHTS RESERVED. 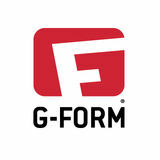 G-FORM, THE GF LOGO, RPT, REACTIVE PROTECTION TECHNOLOGY, ICONIC YELLOW, PRO-X, PRO-T, PRO-G, PRO-B, PRO-S ELITE, PRO-S, PROTECTION FOR EVERY BODY ARE ALL EITHER REGISTERED OR UNREGISTERED TRADEMARKS OF G-FORM, LLC IN THE UNITED STATES AND/OR OTHER COUNTRIES. ALL OTHER PRODUCT NAMES, LOGOS AND TRADEMARKS OF OTHER COMPANIES WHICH ARE REFERENCED IN THIS CATALOG ARE THE PROPERTY OF THOSE COMPANIES.